Patients with foot problems very often require ongoing care to maintain their comfort and quality of life. In many cases, this includes wearing specially designed orthopedic shoes to accommodate particular foot problems such as flat feet. Country Foot Care’s shoe store is unlike any other because not only has it been created by professional podiatrists who truly understand the structure and function of the feet, but it is actually located in a medical podiatry office. It is very reassuring to know that the same highly qualified podiatrists you trust to diagnose and treat your foot problems are available to provide you with shoes customized to meet your individual needs. Our experts will make sure you walk out with footwear constructed and designed to make you as comfortable, attractive, and mobile as possible. Our board-certified pedorthist is knowledgeable and skilled, able to accommodate patients with any condition, such as diabetes, arthritis, or a congenital malformation, that interferes with the wearing of ordinary shoes. At our Mineola, Williston Park and Patchogue offices you have the convenience of one-stop shopping. Whether you are an adult, an athlete, or a person with a foot injury, chronic condition, or congenital defect, when you shop for shoes at our medical shoe store you can rest assured that your health needs, as well as you sense of style, will be attended to with expertise and compassion. 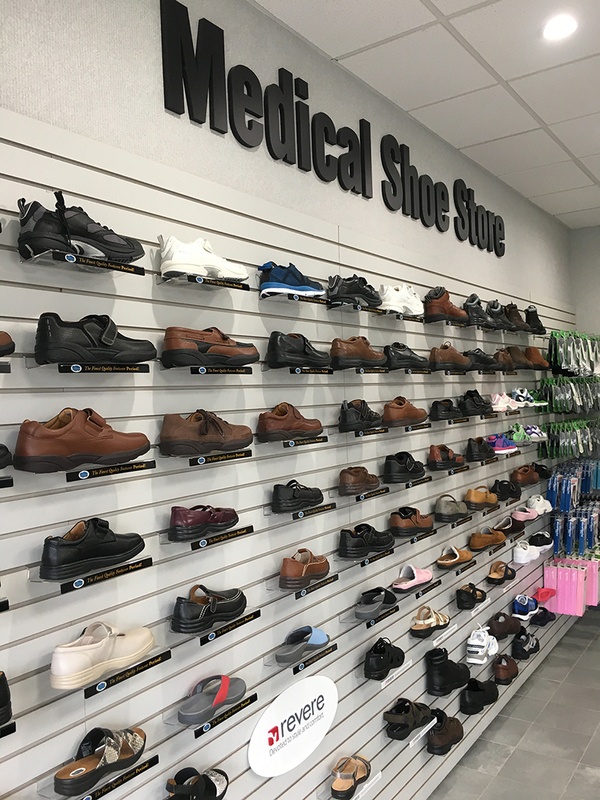 Our Medical Shoe Store is accessible in our Mineola, Williston Park and Patchogue offices during regular office hours by appointment only. Use the “Make an Appointment” button at the top of this page to visit our store or to make an appointment. We will be delighted to fit you in and fit you correctly.